Yesterday we reported about the Back and Front Panels leaked online which confirmed the design of the upcoming Flagship Galaxy S9. Now a Twitter user who goes by the name “Zyad” shared the benchmark results from Geekbench which confirms Snapdragon 845 as the processor. 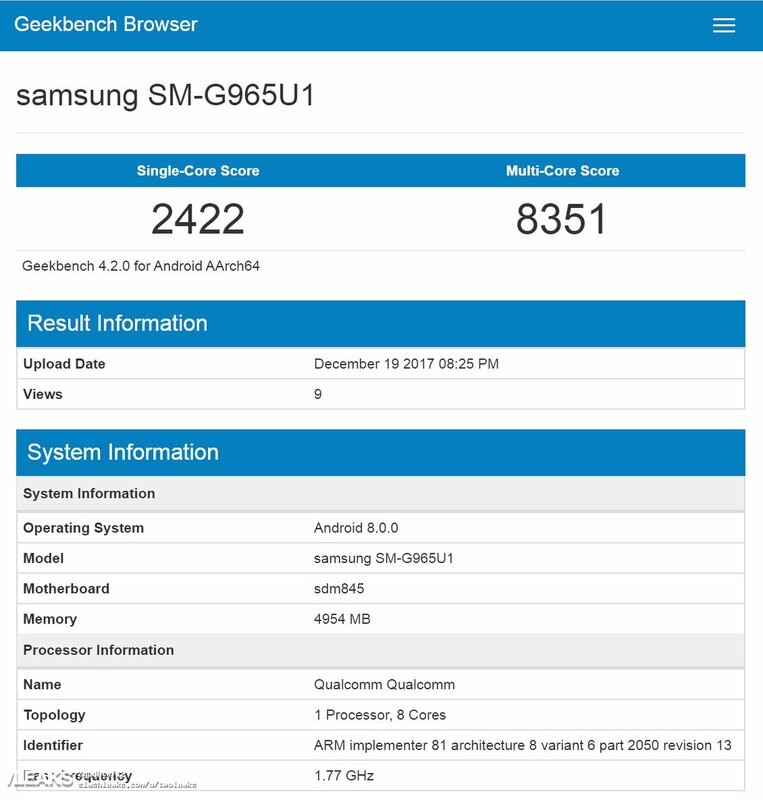 The device is listed as Samsung SM-G965U1 in Geekbench and did confirm other details as well. Galaxy S9 will come with Android Oreo out of the box and will have 6 GB RAM. The Geekbench leak finally gives us a sneak peek at the technical specs of the devices. As for the scores, Galaxy S9 + reaches a single-core score of 2122 points, while it comes to a total of 8351 points in the multi-core test. It should, however, be noted that the device is still not optimized and we don’t know the final scores until Samsung installs Android Oreo into the device. The scores will increase as the hardware and software adapt to work interdependently. No doubt this will give a boost to Qualcomm who is still trying to beat Apple’s A11 chip which scored 10,000 points in the multi-core test and more than 4000 points single-core test.